Mammal Monday -- the Przewalski's horse! This week's mammal is the Przewalski’s Horse (pronounced “sheh-val-skee”). This horse is native to plains and grasslands of Mongolia, as well as other parts of Asia and eastern Europe, but I first saw one at the National Zoo’s Smithsonian Conservation Biology Institute in Front Royal, VA. Although these horses are small (about 13 hands high and between 550 and 750 pounds), they’re impressive with tan fur on their bodies and a short, dark mane and tail. They have evolved to survive the harsh winters in Mongolia, but in the 20th century the species had trouble surviving in the face of habitat loss, loss of water sources to domestic animals, and overhunting. The Przewalski’s horse was declared extinct in the wild by the World Conservation Union in 1970. Thanks to an active captive breeding program, Przewalski’s horses were reintroduced to the wild in 2008. There are currently 1,500 horses in captivity worldwide, and approximately 400 horses in reintroduction sites in Mongolia, Kazahkstan, and China. All of today’s current population of Przewalski’s horses come from 14 ancestors. Thus, the gene pool for this horse is very narrow. Scientists must very carefully coordinate breeding between the captive horses to try to maximize genetic diversity and make the population more able to withstand various stresses, such as disease. So Przewalski’s horse is beautiful, but why should we care about its survival? Because a species like this one tells us when we’re negatively impacting the ecosystem. Humans are part of the natural world; we depend on natural resources for our survival. But sometimes we take more than our share, and the ecosystem on which we depend begins to suffer. Species like Przewalski’s horse tell us when our agricultural or hunting practices are unsustainable. I haven't tried this one yet, but I thought it might be good for the start of school or for a "breakfast for dinner". This recipe comes from the September 2016 issue of Family Circle. Please post a comment if you give it a try! Simmer all ingredients, except preserves, for about 5 minutes. Cool slightly and pour into 4 microwave-safe jars or containers and cover with lids. Reheat in the microwave and top with strawberry preserves. Athletes doing green stuff -- "Seeds of Hope"
Celebrities doing green stuff -- Olympics edition! David Rudisha of Kenya has successfully defended his gold medal in the 800 meter race from London -- way to go! But did you know he's also defending lions in his home country? He now encourages fellow Maasai warriors to compete in the Maasai Olympics (now in its 3rd year), rather than killing lions as a rite of passage into adulthood. A great example of looking at your own lifestyle and figuring out ways to make it more sustainable! Peaches are in season, so be sure to try this delicious cold soup from the September 2005 Gourmet magazine! 1) Purée two thirds of tomatoes and half of peaches with ice, shallot, 1 tablespoon oil, 1 tablespoon vinegar, 2 teaspoons tarragon, 3/4 teaspoon salt, and 1/4 teaspoon pepper in a blender until very smooth, about 1 minute. Force through a medium-mesh sieve into a large glass measure, discarding solids. Stir in water to desired consistency. 2) Toss together remaining tomatoes and peaches with remaining tablespoon oil, remaining 1/2 tablespoon vinegar, remaining teaspoon tarragon, and remaining 1/4 teaspoon each of salt and pepper in a bowl. 3) Serve soup in bowls topped with tomato peach salsa. I've posted in the past about the link between palm oil plantations and orangutan habitat, the nutritional issues associated with palm oil, and a global day of action against conflict palm oil. Now Conservation magazine has a new article summarizing two very interesting studies on the sustainability of palm oil production. With palm oil in many of the products we buy at the grocery store, the issue of sustainable production is an important one. What can you do to encourage sustainability? 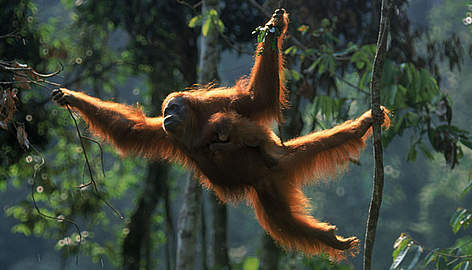 Learn more about orangutans and the palm oil issue! Check out the World Wildlife Fund's Informative website which tells you all about the two species of orangutan, their habitat, and threats to their habitat. Other informative sites include the National Zoo, Orangutan Foundation International, and Rainforest Action Network websites. Check food labels and try to support companies that are RSPO (Roundtable on Sustainable Palm Oil) members. Here's a helpful shopping guide (thanks Climate Mama!) where you can download a palm oil shopping guide -- take it with you when you're at the grocery store! Mammal Monday -- the candy bars of the prairie! Why Eat Low on the Food Chain? It's #MeatFreeWeek, so everyday I'm reposting some of my favorite meat-free Friday recipes. For #MeatFreeFriday, we'll talk about why we want to go meat free -- enjoy! And be sure to "like" greenmomster on Facebook and Twitter for more recipes and environmental news! Have you heard the latest announcement from the World Health Organization (WHO), stating that processed and red meats increase your risk of cancer? Not really new news, but now WHO is making the info a little more well-known. It's #MeatFreeWeek, so everyday I'm reposting some of my favorite meat-free Friday recipes -- enjoy! And be sure to "like" greenmomster on Facebook and Twitter for more recipes and environmental news! What to do with those last tomatoes in your garden? Here’s a great gazpacho recipe from my mother-in-law – enjoy! Mammal Monday -- the Solenodon! The Solenodon is a rodent which populates the islands of Cuba and Hispaniola in the Caribbean. Solenodon paradoxus is the species found in Hispaniola. It is believed that Solenodons have been around for 75 million years, meaning they were around at the time of the dinosaurs! Though Solenodons have survived for this huge amount of time, they are unfortunately in danger of becoming extinct due to human activity. It is unfortunate that the Solenodon is slowly becoming extinct for two reasons. First, the Solenodon kills and eats many unwanted pests that annoy humans. Second, they are one of the weirdest animals in the world. The Solenodon gets its name from the grooves in its teeth through which it injects its venom into victims. It is the only mammal which can inject venom. Even though these animals are aggressive killers (it is recorded that in captivity one literally shredded a live chicken before eating it), they are extremely clumsy. When frightened, the Solenodon will either put its head toward the ground and stay still, or it will run away and, in many cases, trip on its feet causing it to roll. This inability to get away from threats is one reason the Solenodon is so close to being extinct. The Solenodon originally thrived on its two home islands because it had very few predators. When the Europeans colonized the islands, however, they brought with them dogs, cats, and, later on, mongooses. These three predators can easily kill a Solenodon, and they are believed to be the main cause of the creature’s endangered status. Another problem is the deforestation of the islands on which it lives. The forests provided a habitat for the Solenodon’s food: insects, lizards, and plants. The Solenodon is part of the Last Survivors Project. This project was created to raise awareness about Caribbean land dwelling rodents and preserve them. The project’s work on Solenodons is mainly focused on learning more about the animals. The project managers believe that the more they know about the animals, the better they will be able to help them. Morelle, Rebecca. "Solenodon Hunt: Close Encounter with a Bizarre Beast." BBC News. BBC, 06 Feb. 2010. Web. 11 June 2013.